Sustainable food and farming advocates have long been pushing us to learn more about our food, from decoding nutrition labels at the supermarket to shaking hands with the growers at the farmers’ market. We’ve uncovered some surprising truths, like the fact that milling grains can strip away much of their nutritional value, or that our country’s meat supply is in the hands of just four companies. Yet even as more and more Americans are beginning to ask tough questions about our food system, Nicole Cotroneo Jolly realized we often skip over the basics. Simply put, how does food become, well, food? In her new video series How Does It Grow?, Jolly explores the production process of common foods whose biological origins may elude most of the general public. Produced with her husband Mark, the series is designed to engage consumers in a conversation about the nuts and bolts of farming, with the hope that viewers will feel empowered to advocate for healthier, more ecologically sound growing practices as a result. We spoke with Jolly about the story behind How Does It Grow?, the process behind it, and her drive to want to rediscover our food’s roots. 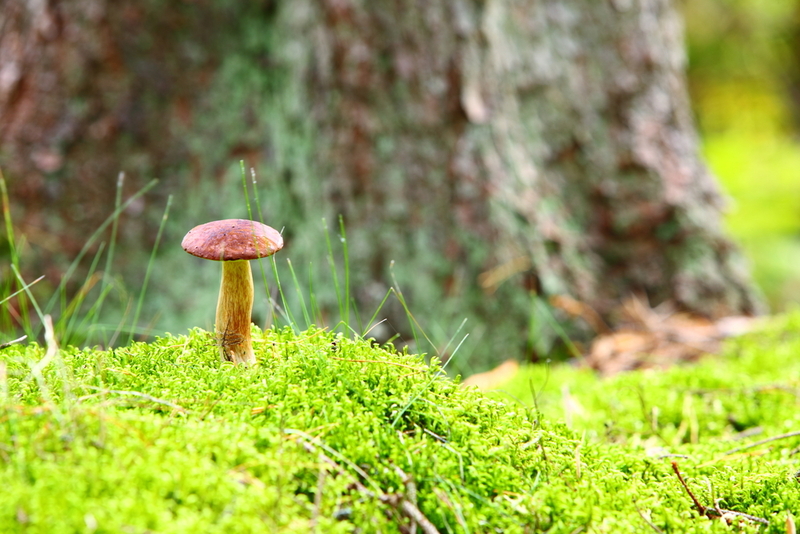 Check out the first installment on mushrooms below. The idea had been brewing in my mind for a while, but two experiences crystallized the need for such a series. First, at a picnic, I met this man in his mid-20s from Newark, New Jersey. As I passed him a bowl of fruit, I was amazed to learn he’d never eaten a sweet, juicy summer cherry. He was resistant to trying one, and it took a bit of coaxing, but once he did, the surprise and delight on his face was unforgettable. Soon after this encounter, I was preparing dinner, pouring lentils into a bowl to rinse, when it hit me: I didn’t know the first thing about how these little brown pellets grew. I couldn’t even picture a lentil plant. I started poking about online, and I was surprised that there wasn’t a comprehensive source about how our food grows. As a filmmaker and video producer, I imagined the power that a series of compelling video stories could have on educating us about our food. I thought that if my friend from the picnic had, as a youth, watched a video about how cherries grow–with gorgeous footage of the cherry trees in bloom, the bees that farmers depend on to pollinate the trees, and the fruit hanging heavy and glistening on the branch–then maybe he would have been more inclined to try them. How did you decide which foods to highlight? We feel it’s important to prioritize the major crops that feed the world–rice, wheat, corn, etc.–and also the crops that you don’t tend to grow in a school or backyard garden. In other words, the foods that most people will never encounter before they hit the grocery shelf (in most cases, in very different, very processed forms). We’ve also sent out surveys to the 320 backers of our Kickstarter campaign—which raised the money to produce the first season—and asked them what they would like to see. We’re also talking with nutrition and agricultural educators to try to sync with their curricula. Of course, at the end of the day, we have to follow the seasons and also assess the cost of sending a crew to a particular growing region. Our goal is to take the series international: We want to cover bananas, coffee, nuts, seasonings, and spices. But we have to find the right partners and sponsors first in order to make that happen. Once you’ve chosen a food, what’s next? I founded this project with my husband, and we both started our careers as journalists. If there’s one thing we know how to do, it’s research! After we identify the major growing regions for a crop, we then search for a farm that meets several criteria. For instance, we want to feature farmers who are sustainably focused, and who can show us the full story of that particular food. We’ve also begun building a network of trusted advisors, including community supported agriculture (CSA) and farmers’ market coordinators, who have established relationships with producers and can help recommend farms to us. We also welcome farmers to get in touch. What has been the most interesting or exciting thing you’ve learned so far? There is an entire body of important, life-sustaining knowledge that is in the hands of relatively few people. Think about it: If a global apocalypse happened tomorrow, and a few survivors found the seed vault in Norway, would they be capable of growing food from those seeds? Probably not. Farmers who live and breathe their work are still at the mercy of the environmental conditions they’re given. Growing food is no easy business—and it’s a business most of us take for granted every time we enter a supermarket. What role do you hope the series will have in increasing people’s knowledge about food, both online and off? I have heard too many stories from teachers about how disconnected their students are from their food—the boy who didn’t know that a French fry was a potato, or the girl who was stunned to find out that pears grow on trees when she saw a leaf still attached to a pear’s stem. How can we expect children to choose healthy, whole foods if they don’t even know how to identify them? We believe our series can help bridge that knowledge gap. Video storytelling may be the most powerful way for young people to learn this stuff. Rather than preach, we can give kids (and their parents) the opportunity to fall in love with their fruits, vegetables, and whole grains by letting the food (and the farmers) speak for themselves. You chose mushrooms for the first episode. What’s next on the plate? We’ve got several episodes in pre-production right now. But you’ll have to stay tuned to find out which one is released first!